For all you Maroon 5 fans out there, we’ve got a special Livestream treat for you tonight. As part of the release of their third studio album, Hands All Over , Maroon 5 will be performing live and chatting with fans at Facebook HQ. Like the Doobie Brothers, Gorillaz, and the Slurpee Battle of the Bands online events, tonight’s show has a live social element to it that makes the event interactive between the band and the fans. Tonight September 30 at 7PM PT/10PM ET, Livestream will broadcast and fans will be able to ask the band questions directly via Twitter and Facebook. 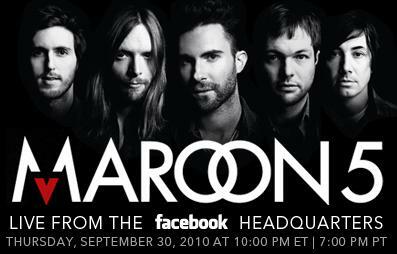 You can tune into the live performance and chat with the band on Maroon 5’s Livestream page at livestream.com/Maroon5 and Facebook page at facebook.com/Maroon5. We’ll also excited to share this experience as it continues our exploration into mobile use at concerts. So, if you’re not able to get to a computer tonight, you can also watch the event from your mobile devices at mobile.livestream.com/Maroon5. And if you want to see it all happen right here on Live Fix we have a convenient Livestream player below. After the show we invite you to let us know what you thought of the Livestream show and tell your story by sharing your favorite Maroon 5 concert experiences in the comments below. You can also check out more exclusive Live Fix fan interviews here.